A historic regional form of landscape is restored as a way to link a building to its surroundings. Known as 'oak openings' in prairie planting, this form of landscape was present in Ohio before the arrival of Columbus. 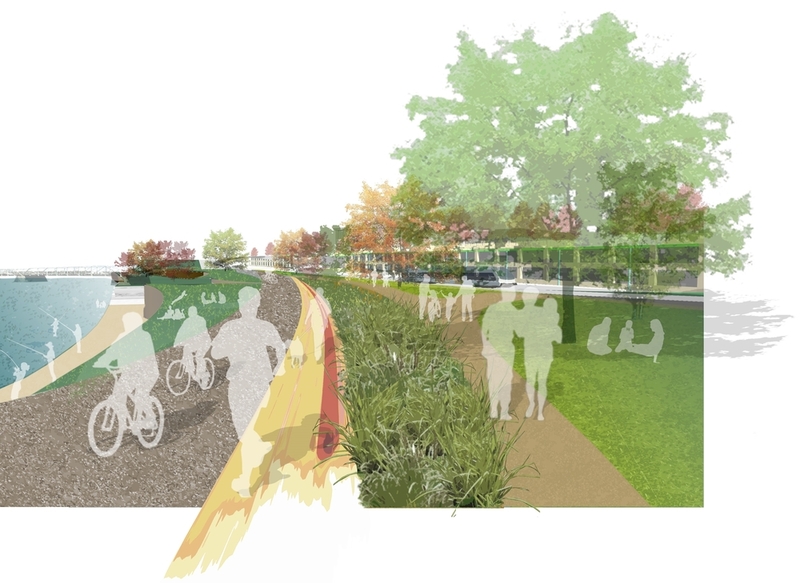 Balmori Associates' design scheme conceived of the Owens Corning World Headquarters project as an opportunity to restore this landscape form the area, an island in the Maumee River which was formerly a railroad site and then a dump site. The headquarters is sited on this island, in the heart of downtown Toledo. The oak opening landscape surrounds the whole complex; an intersecting trail for joggers and sightseers runs by the river's edge and through this landscape. 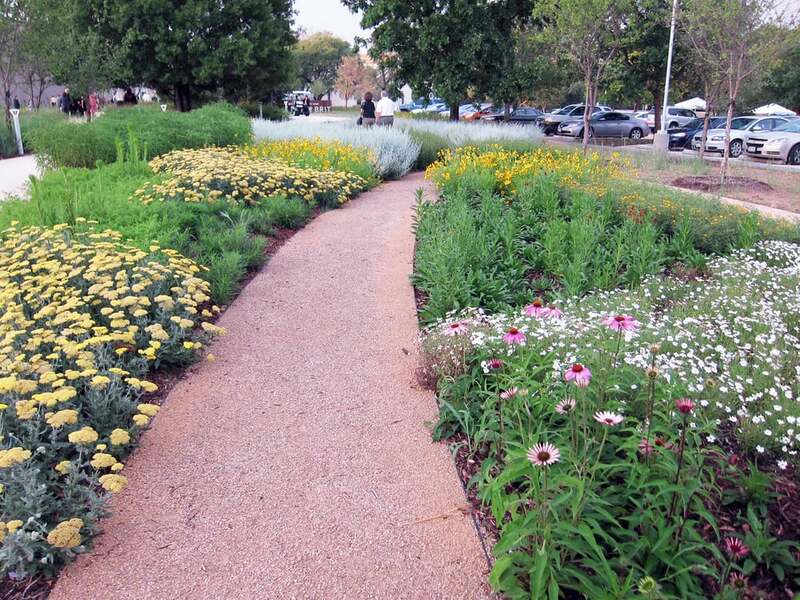 A secluded gated courtyard nestled among the main buildings offers a garden landscape as a contrast to the oak opening prairie outside and provides protected seating during severe seasons. 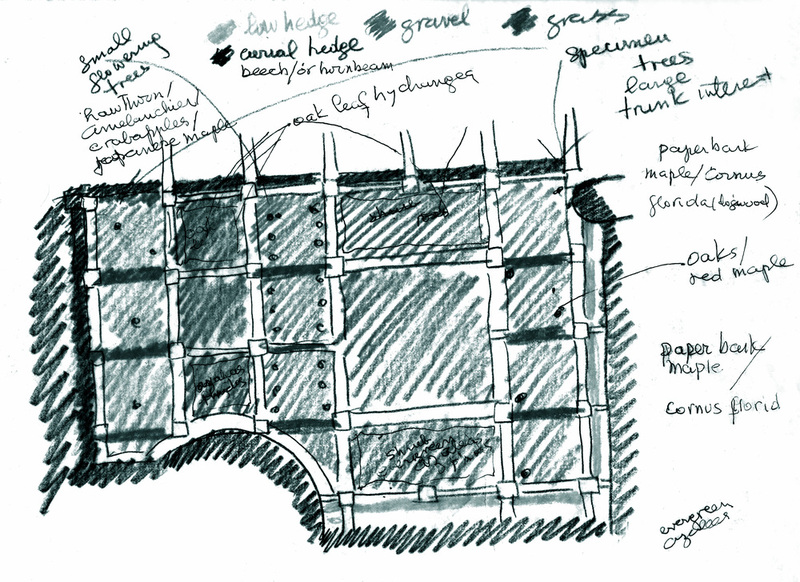 The meandering willow and dogwood hedge provides enclosure for each individual garden. The arching brick path and parallel row of oak trees define the edge between the courtyard gardens and the great lawn. Outdoor summer concerts are one of the several types of events taking place on the landscape's great lawn. Citrus trees flank an inlaid path that winds through a new courtyard for the arts, unifying the campus buildings, carving out a space for respite, and creating a historical link in a campus originally dedicated to agricultural research on oranges and grapefruits for the California citrus industry. Historical citruses were grown specifically for the project. The path is inscribed with lines of poetry that carry special significance for landscape and the site: Marilou Awiakta's Motheroot, and an excerpt from Virgil's Georgics. At Vassar College, two courtyards and a sculpture garden connect a 1913 art center building to later additions. Voids play against built solids. Traditional and modern materials combine to integrate old and new. A stone and aluminum bench in the entry court terminates the axis from the new entry pavilion that leads to a sculpture courtyard. This courtyard, an intimate, glass-enclosed space, was designed as a visual extension of the reception area within the art center. Its rotating sculptures sit on a bed of yellow gravel. 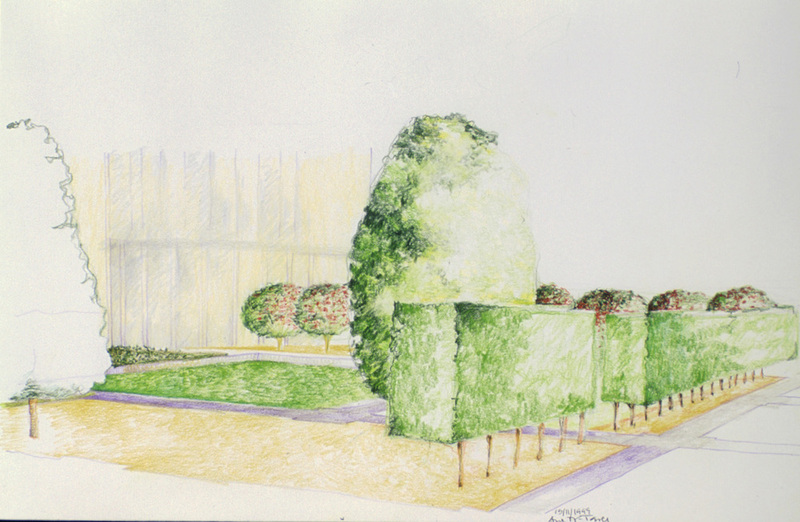 In the sculpture garden, a large L-shaped area and paved sections intersects with a delicately planted space. Red-leafed plantings ring the garden's perimeter and were chosen as background color for the monochromatic metal sculptures that will be exhibited. 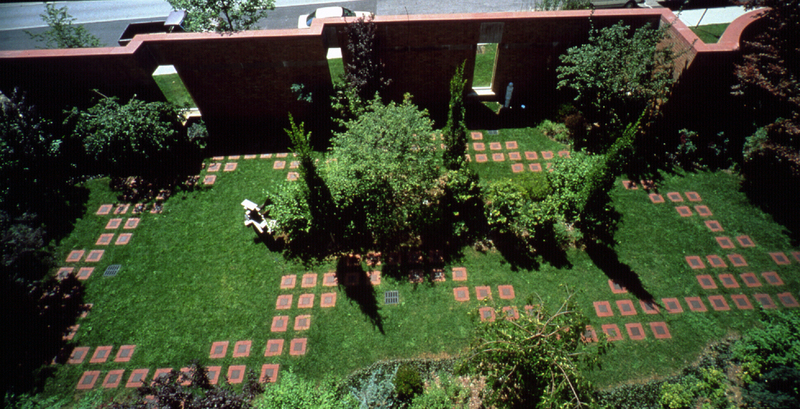 This sunken courtyard was designed to serve as an accompaniment to the Avery Hall performing arts center and a Boyar dormitory. 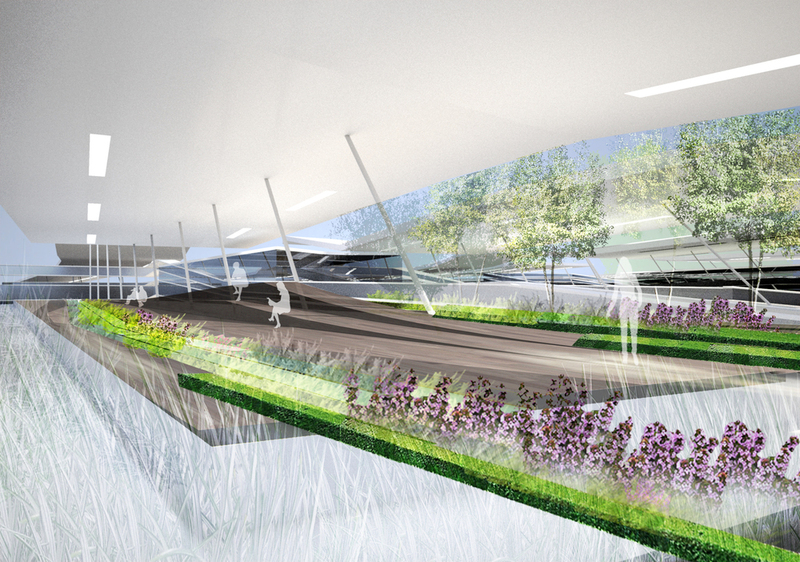 It is to be designed to hold outdoor performances, movie screenings and as an outdoor study space. The Tianjin Culture Park is both a centralized park that defines the heart of the cultural district and an extension of the surrounding city. 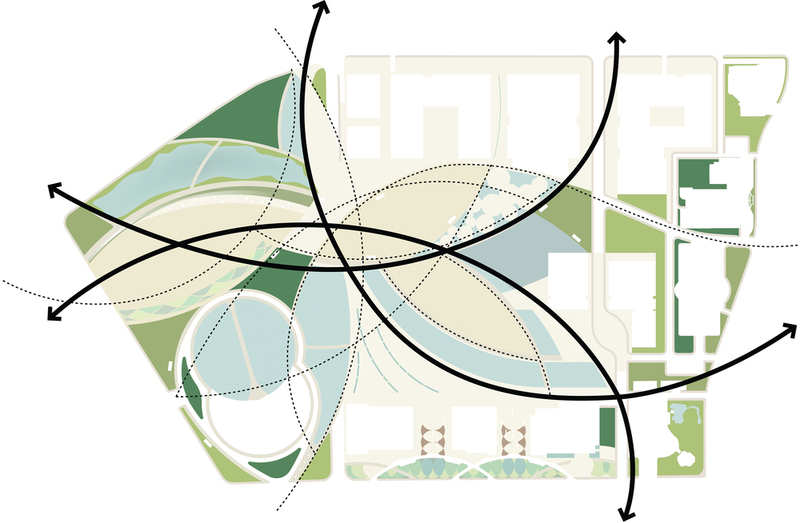 Sweeping arcs of pathways and landscape carve out a layered hierarchy of active public space and parks that unfold, weaving together the cultural, retail, and social architecture of the surrounding areas. 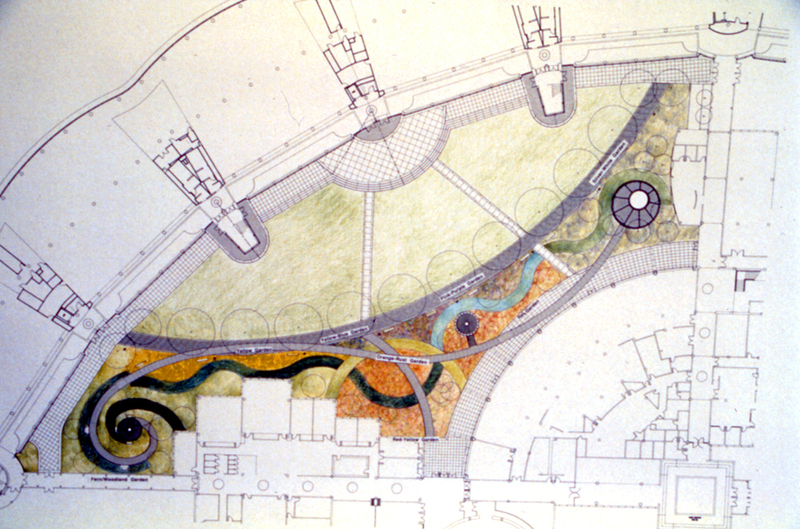 The architecture is embedded with this network of paths and park. Water features facilitate the flow of the landscape through the site while the spines of the adjacent pathways animate the flow of the city. The main promenade moves across the park from the city to the museum, library and performing arts core. Secondary pathways connect the retail to the museum and the city. Each of the pathways run parallel to water and defines a character of park. The central plaza is a grand space for public spectacle and events. 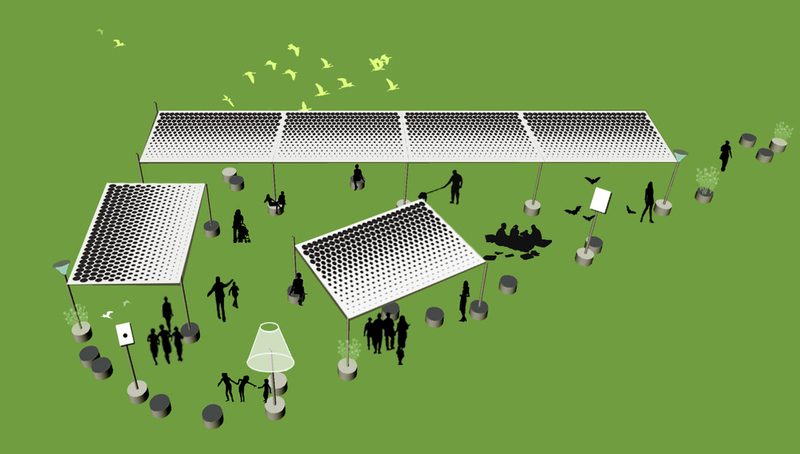 Moving across the site a large canopy with a moon gate separates a market park for smaller scale gatherings and events. The canopy is repeated 3 times as sculptural elements that both define the different spaces and provide shade and covered spaces for markets, cafes and site amenities. They canopies are also iconic sculptural elements which frame the architecture and orient the site. 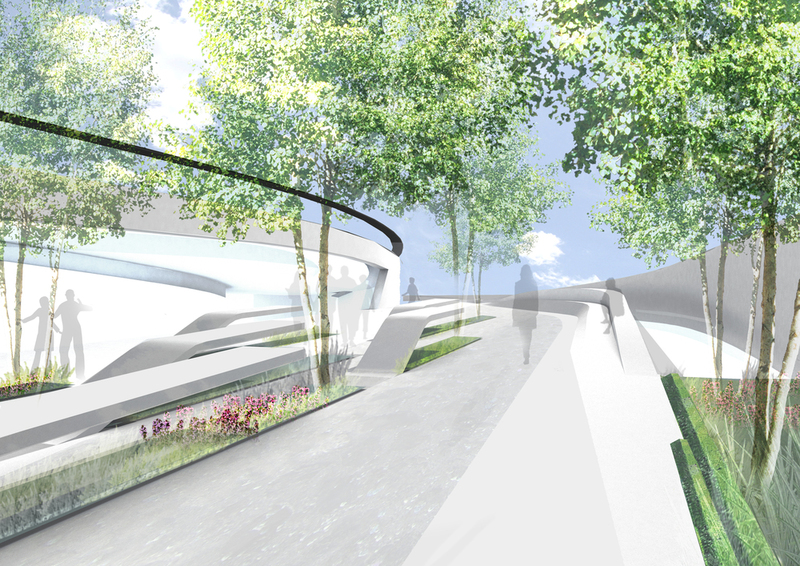 The next space is an entry plaza to the museum and library, with benches and gardens to relax and socialize. The water features serve a dual purpose to the park. They are part of water collection and filtering system and have varying levels to allow for various uses and feeling and light reflection. The first (starting from the west) is a naturalized pond with interpretations of traditional bridges traversing willow trees and gardens. The next pool has a few steps that people can sit on and rent a model boat. The pool leading up to the museums and library is also line with steps and is a shallow reflecting pool – then in times of low rainfall or for events can be drained as additional plaza space or ice skating in the winter. The pools all engage the architecture, allowing the buildings to borrow the image and feeling of being near the water. Waterfalls in front of the large iconic canopies feed the water in front of the performing arts center. Finally, in front of the retail mall, floating decks sit in the water as people eat at cafes under the canopy. The movement between the levels will be choreographed to provide a visual spectacle, and clean the water. We propose to make Tianjin Culture Park a Special Ecology Zone or SECOZ: an area that encourages experimentation in groundbreaking ecological technologies, creating a space that demonstrates the leading edge in the transformation of public space into an active ecological engine. 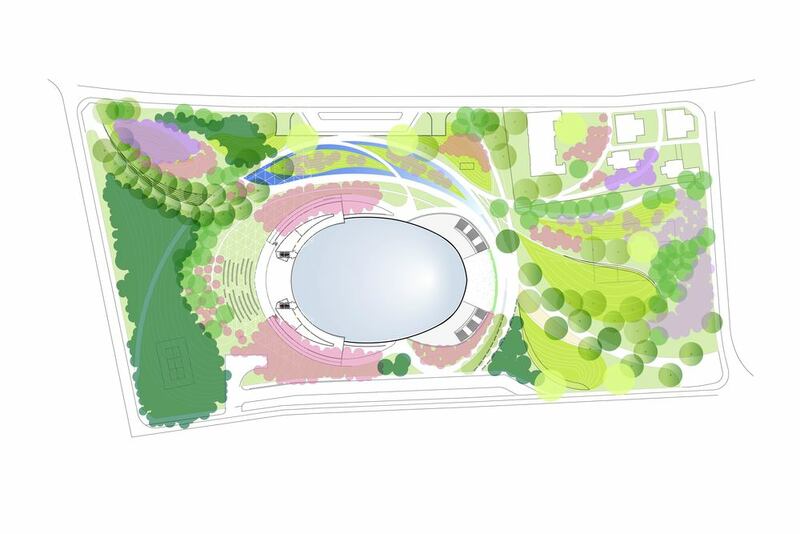 The SECOZ transforms Tianjin Culture Park into a green connector; a continuous swath of green open space filters air and water and provides relief from urban congestion. Balmori Associates’ landscape intervention for Samsung’s employee education center tower features multifunctional land burn containing programmatic elements that wraps around the site and its adjacent edges. This landform is the organizing principle for the Samsung complex and interfaces with the building’s architecture. The surfaces and materials of this three-dimensional landform create a multilayered interface and the opportunity for new types of spaces. 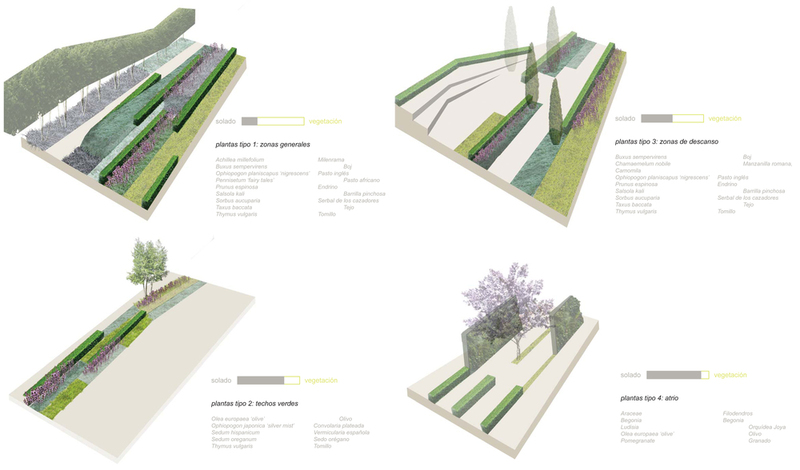 Alternating sheaves of landscape and architecture exist on both horizontal and vertical planes. The linear landform flows from existing landmass of the site and its adjacent edges. It is the organizing principle by which a new learning center identity is patterned in the spirit of Samsung’s paradigm. Common materials are used in fresh combinations to create richly layered and textured surfaces and lines. 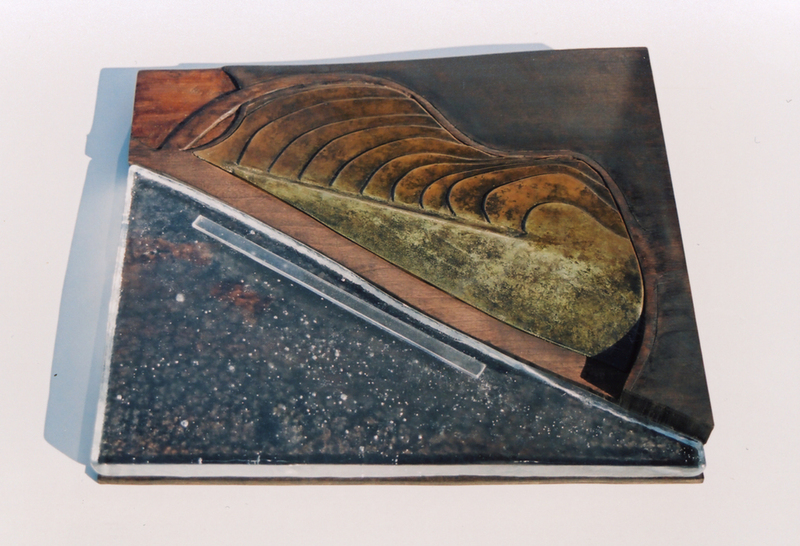 These surfaces and lines are an effort to explore the interface of landscape and buildings. Reconfiguring the space in between and making new connections create more fluid passages- not blurring the line between landscape and architecture – but widening it. This thick interface creates the opportunity for new types of spaces. Thus, the widening of the line is to create transitions- alternating sheaves of landscape and building on horizontal and vertical planes. 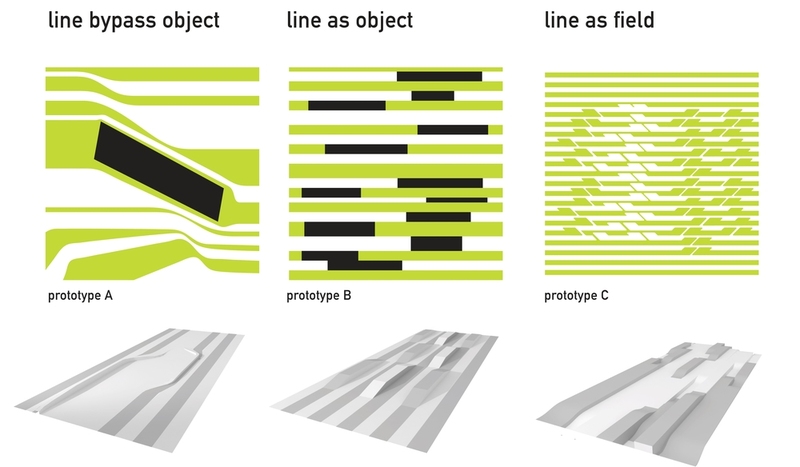 It is a complex interface that is layered – the thicker the line the better – and results in a new spatial entity. 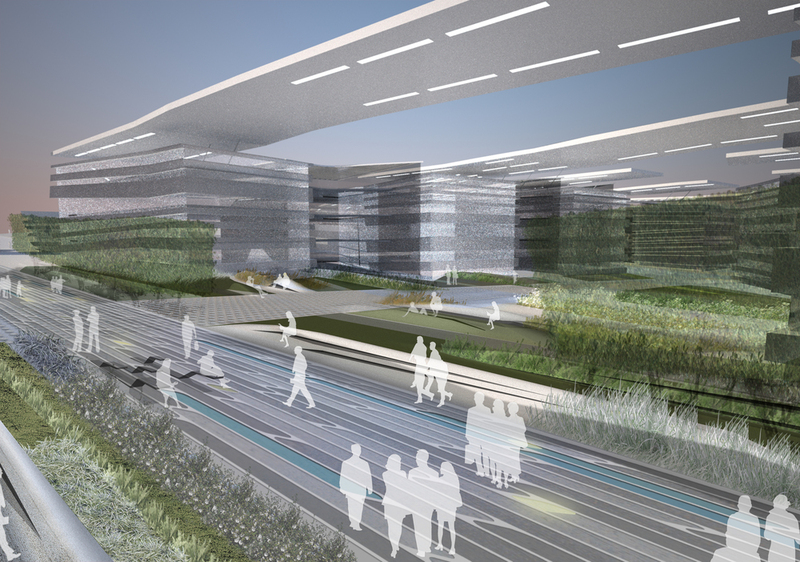 Our team was one of the two finalist in a bid to design the new headquarters of the leading financial group in Spain. 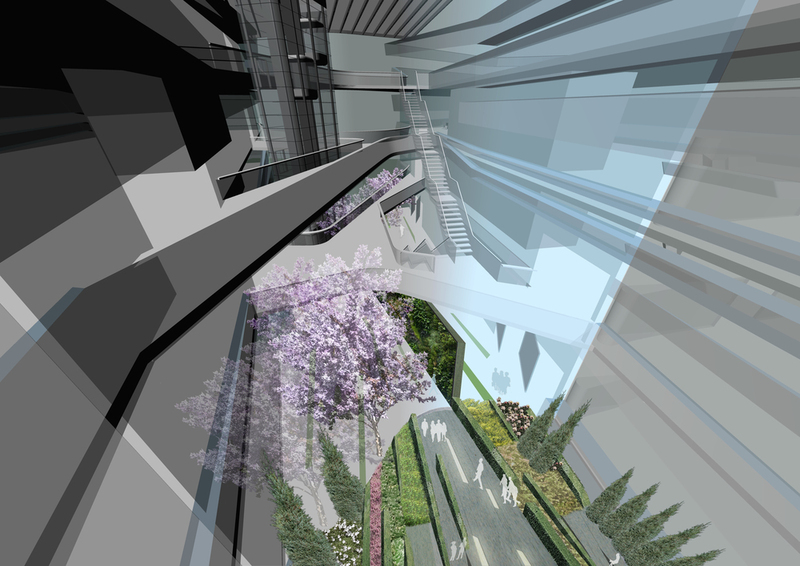 Working with Zaha Hadid Architects and the concept of speed, our landscape proposal emphasized the linearity and movement of the building design in a cohesive banding of planted and paved areas that fillet and constrict in reaction to the built environment. The initial reasoning behind the concept of speed is consistent with BBVA’s goals of technology and progress. 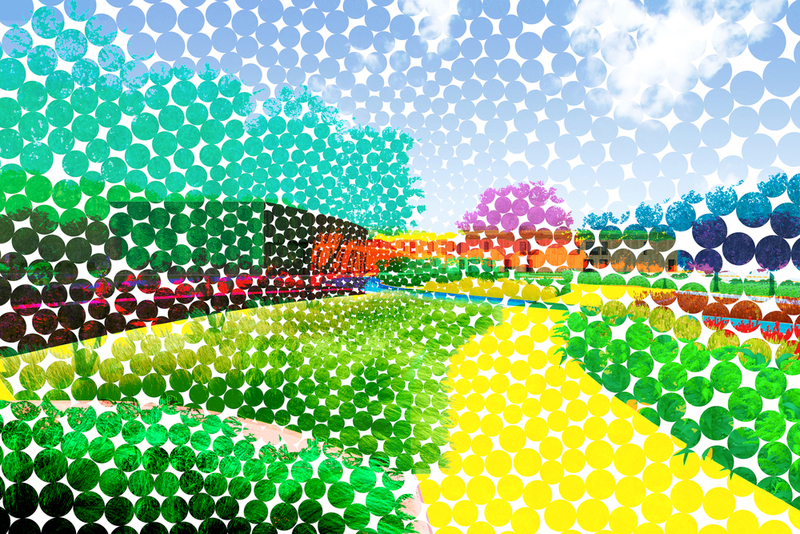 Topographical shifts in the groundplane help to further define the different areas within the office park. As the linear bands peel away and bifurcate, exterior elements such as seating areas, tables, and enclosures are created as moments of rest within the matrix of speed that makes up the site. 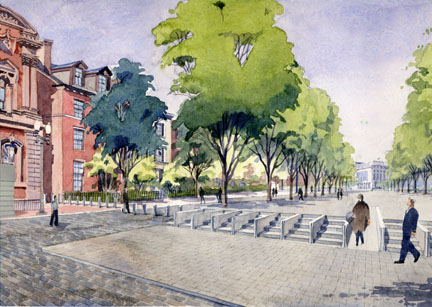 The National Capital Planning Commission initiated a competition to create a plan for a safe and beautiful civic space on Pennsylvania Avenue in front of the White House. Currently blocked with jersey barriers and police cars, the avenue has not been open to vehicular traffic since President Clinton ordered it closed in 1995 after the Oklahoma City bombing. 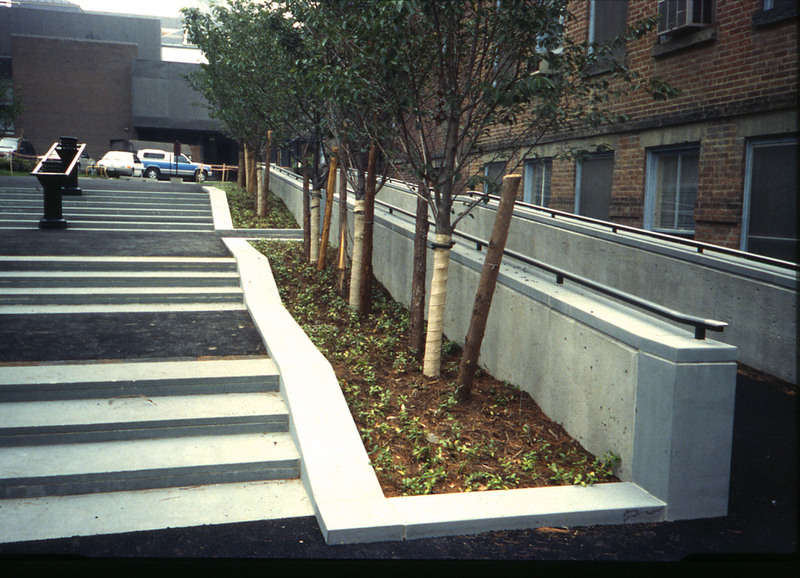 In light of increased national security, the competition sought innovative solutions to integrate security with urban landscape design. 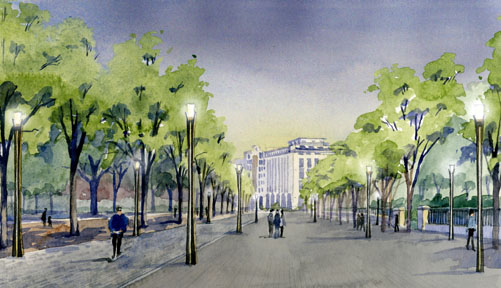 Balmori Associates proposal reinstates Pennsylvania Avenue’s civic prominence. The plan uses subtle grading shifts to visually elevate the White House and provide security at the intersections of 15th and 17th Streets. 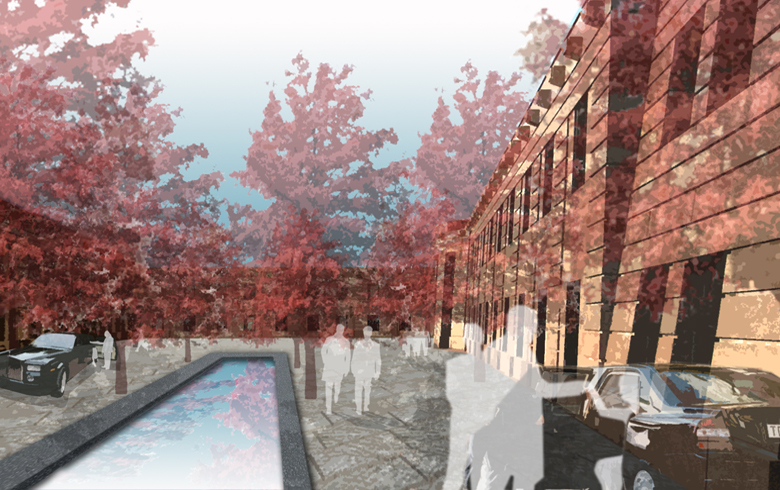 The expanse of the former six lane road is transformed into a dignified pedestrian boulevard through a rhythmic placing of trees, urban furniture and atmospheric lighting. Directly in front of the White House, Pennsylvania Avenue is lowered slightly to reveal three steps. 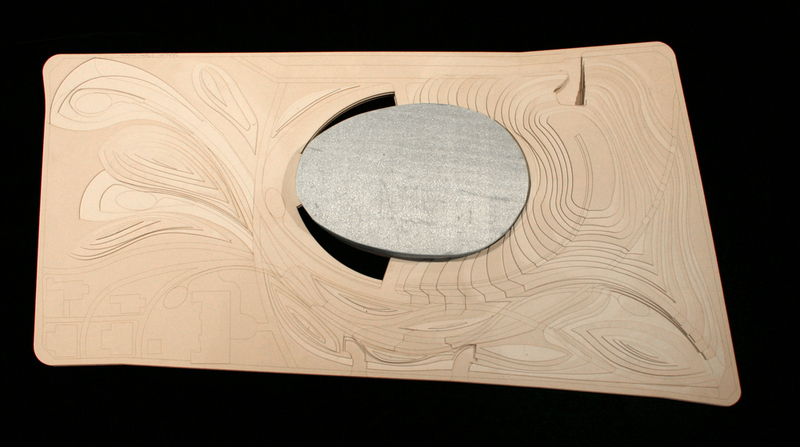 This inflection creates a platform and frames a view of the White House. The elegant bowing of the grade smoothly reverses itself by rising at the ends of Pennsylvania Avenue to provide the required security barrier in the form of a civic entry staircase. This promenade is easily converted from a pedestrian plaza to a parade route for inaugurations and other events and guard posts are integrated into a separate security and future trolley circulator on the Lafayette Park side of Pennsylvania Avenue. This is a park created out of land liberated through the consolidation of existing surface parking into a stacked system. The newly gained elevation from the parking garage re-creates the bluff that once existed behind the state house, providing a fantastic view of the Delaware River. From this new bluff a gentle descending slope crosses the boulevard and brings you to the river’s edge. 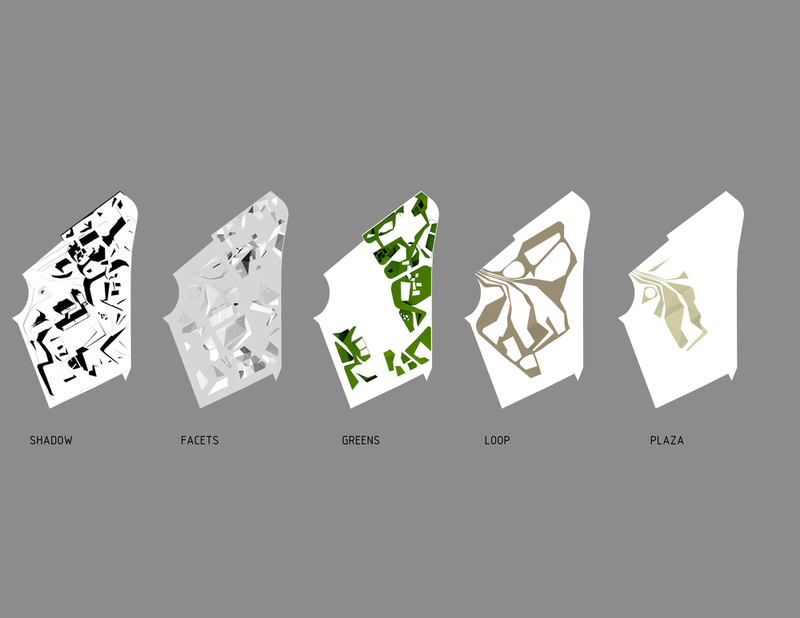 This project is about the creation of a new identity for Trenton’s Capitol Complex through a landscape that unites and relates to the historical context without being tied to the historical concept of a park. For this competition, we met with local community groups in order to better understand the needs of local users. Our goal was to work with these groups as well as others to ensure that the park is one which serves the people of Trenton. Biking, walking, bird watching, sunbathing, school groups learning about the New Jersey plants and history, these are all activities envisioned for Trenton’s new park. The Design for Pennine Lancanshire Squared competition aimed to protect and enhance Accrington’s strongest features, to incorporate new ones from its own history, and to create a distinctive and timeless space with elements, which strengthen the local character, offer new opportunities, and engender civic pride. Through Programmatic Elements Including Radio Free ACCY, a Speakers’ Corner the project brought people together aiding community cohesion. Peel Square Market Hall has been made the new hub of Peel Square, cornerstone of its regeneration. The hub of activities planned inside and outside (radio station, incubator office, internet café, organic food organization, cabinet for Accrington history display, Speakers Corner, Accrington Pals memorial, see report) all make it the radiating center capable of spilling out in its surroundings and activating them in the form of citizen activities, of additional temporary market stalls, cafes, etc. The space has been designed accordingly as a very simple uncluttered expanse with good quality pavement, an abundance of benches -- which can be reconfigured for flexible spatial arrangements -- and strings of lighting creating a lit-up urban room out of Peel Square. 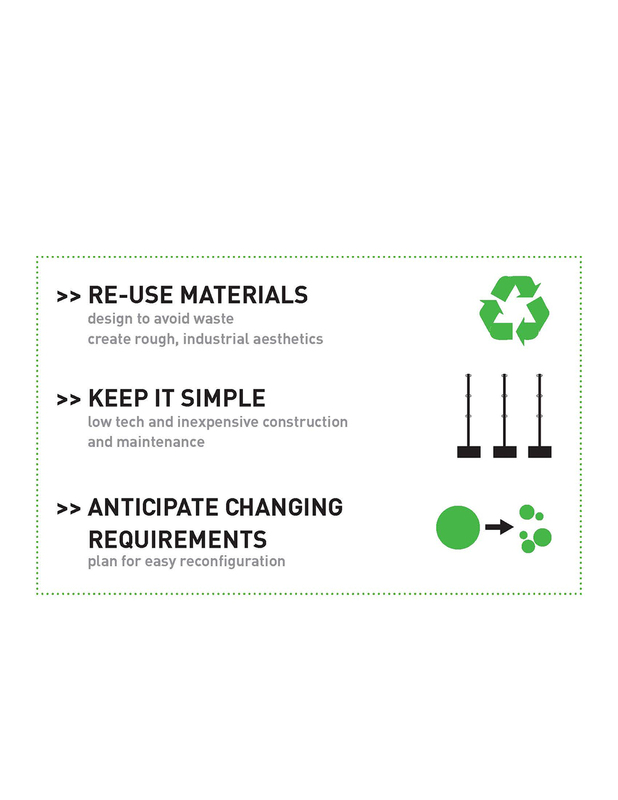 These three elements can be phased. In the end regeneration is about quality of life. It can lead to attracting people to the town and keeping its young people in it. A beautiful place that gives a sense of place, many towns have found , can be the trigger for economic transformation. A mixed-use complex in the heart of Tottori Prefecture, the Chubu Cultural Center and Museum is intended to reinvigorate the city center and region. 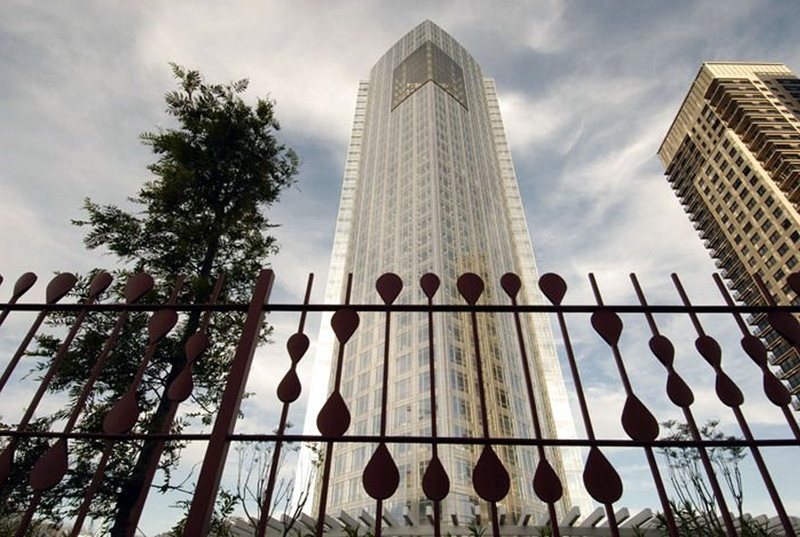 The master plan for the project was designed by Cesar Pelli & Associates in collaboration with Balmori Associates. The complex comprises a Performing Arts Center, Women’s Center, Museum and two major open spaces, the Kurayoshi Commons and an Outdoor Plaza, which are connected along the property line between the City and the Prefecture. 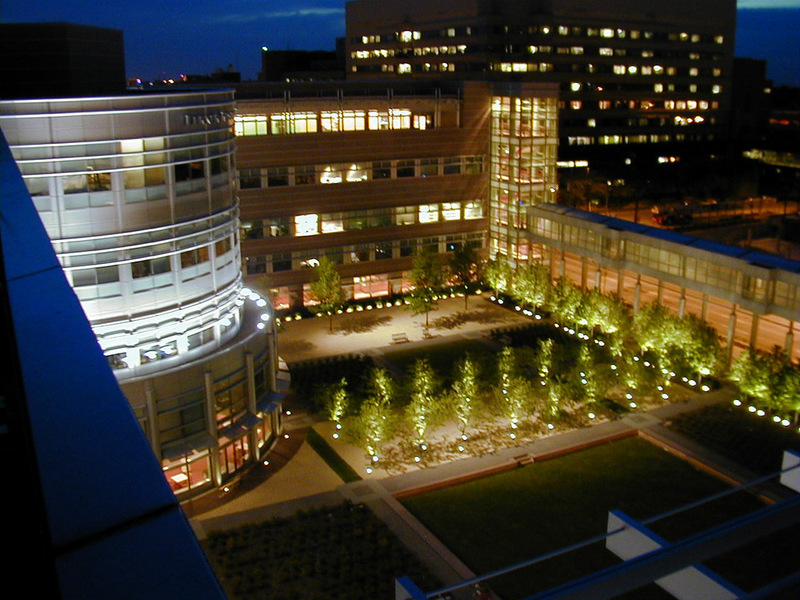 The Kurayoshi Library, also designed by Cesar Pelli & Associates, lies north of the landscaped Plaza, adjacent to the Cultural Center. The Performing Arts Center accommodates a 1500-seat symphony hall, a 300-seat multi-purpose theater, a large rehearsal room and support spaces. 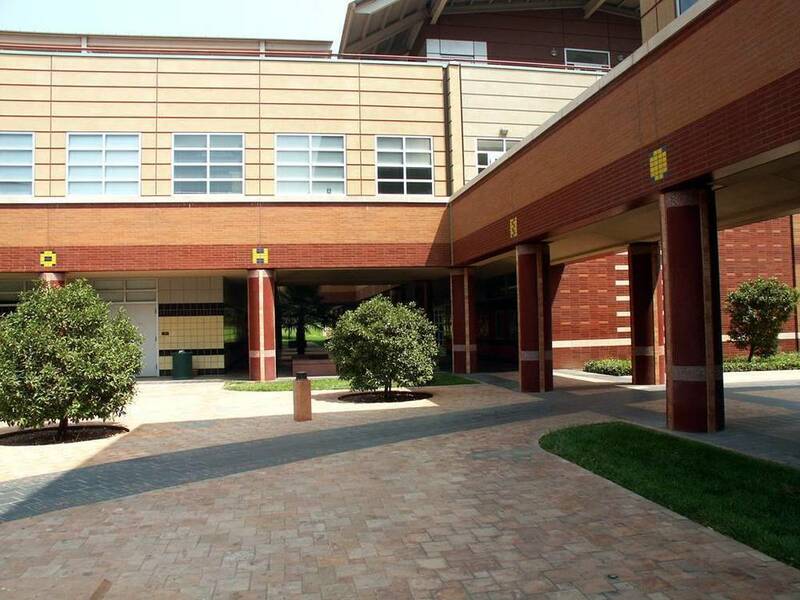 The Women’s Center includes a communications salon, children’s center, library and a wide array of seminar rooms. The new Museum is a showcase for Tottori’s famous “20th Century Pear”, with a seriesof exhibits dedicated to the history and cultivation of this distinctive fruit. The facility will also support a virtual reality theater. The Kurayoshi Commons, a glazed public room 42 meters in height, is the central element around which all other components of the complex are organized. It serves as a lobby for the performing arts facilities, as additional exhibition space, and as a forecourt for the women’s center, restaurant and shops. Its design is expressive of both the City of Kurayoshi and the Tottori region. 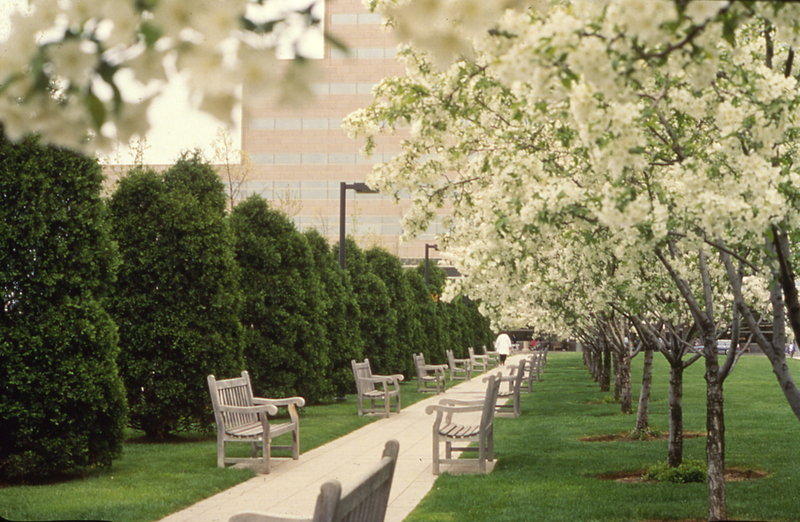 The Commons and the adjacent Outdoor Plaza offer ideal venues for public gatherings, concerts, fairs and festivals. 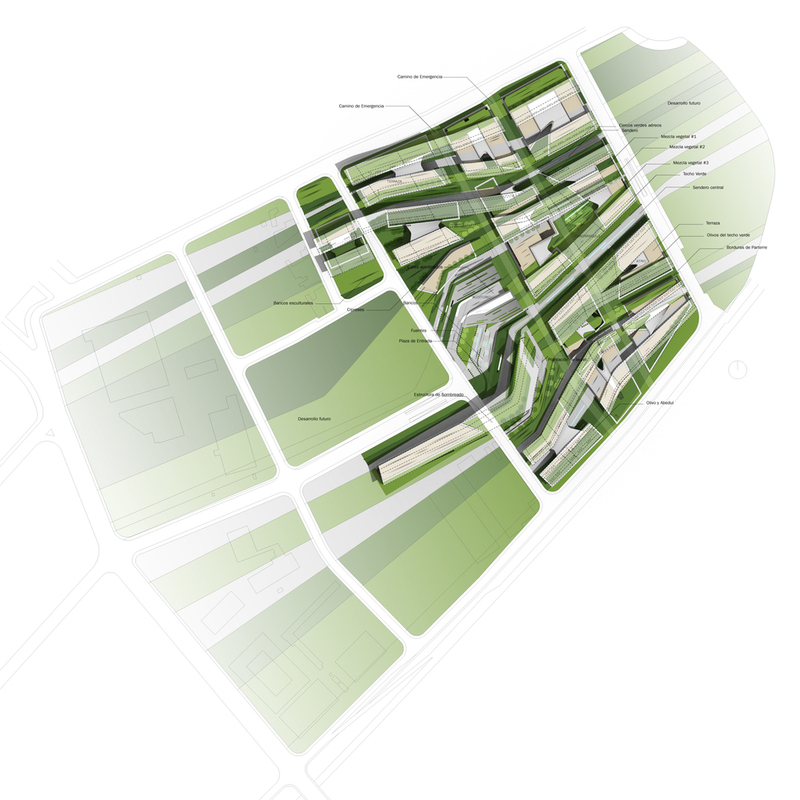 The diagonal plan geometry reflects the various city grids which cross the site. The large wooden trusses that support the extensive glazing relate to indigenous construction techniques. 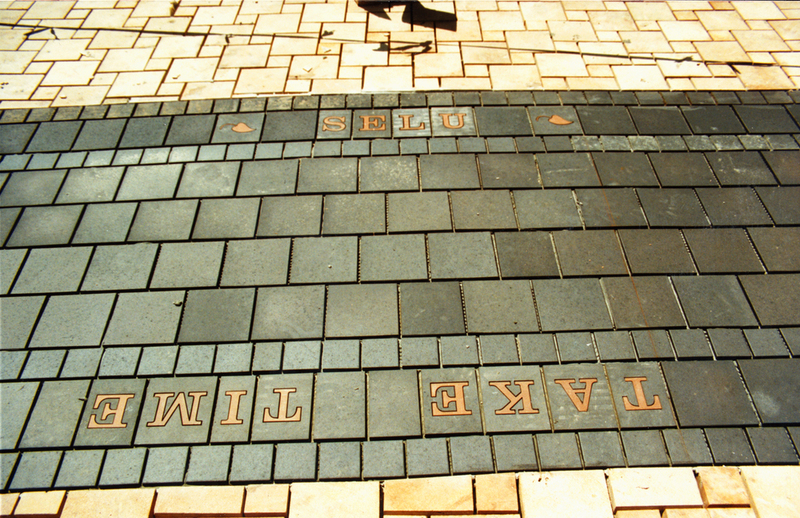 The paving designs were based upon the traditional local kasuri fabrics that represented pine bark and fish scales. Nature translated into fabric that was in turn translated into granite paving.